A young Bulgarian immigrant returns to the country of his birth in search of his grandfather, who suddenly and unexpectedly cut all contact with the family three years ago. High up in the Strandja Mountains he gets drawn by his grandfather into a maze of half-truths. And here, he falls in love with an unobtainable Muslim girl. ...a dark, dreamlike debut novel steeped in Balkan history and legend ... Stork Mountain is a beautiful and haunting novel, one that delves into a painful past and begs the questions: To what extent are we doomed to relive the past and carry it with us? At what point must we relent and set it free? An intelligently mapped plot complements the skilful blend of familial relationships with religious commentary, and elements of the hamlets’ folklore and rituals lend an added mystery; the story brims but doesn’t feel crowded. This is a historically rich study of borders: those imposed by cartography and those that are self-constructed. ...a sprawling, wildly ambitious novel into which Penkov crams centuries of history and folklore ... By the end, the author’s ambitions have outrun his ability to harness them, but if Stork Mountain is sometimes incoherent, it is seldom dull and always intriguing ... 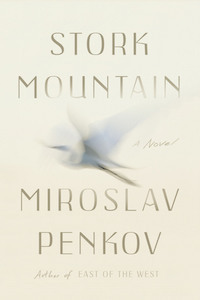 Soaring into the fantastic while claiming an anchor in gritty reality is a tricky artistic strategy, and Penkov doesn’t quite pull it off ... Stork Mountain is by no means perfect, but it’s thoughtful and thought-provoking, with a passionate faith in the redemptive powers of art. What did you think of Stork Mountain?